When kids are home, they want something or other to keep themselves busy. Sometimes they even want to offer some help in the kitchen. But our usual reaction is – It’s okay. Go outside and play. I will call you once your food is ready. Before we move forward with today’s post, let’s have a look at this mom-kid conversation. I am sure most of us will relate to it. Kiddo: Can I have lemonade please? It’s so hot. Kiddo: Can I help you please? Kiddo: It’s yummy…Next time I will help you mamma. Ponder on: Why this ‘next time’? Why not today when they want to help? When you let your little chef step into the kitchen, they have a feeling of fulfilment, happiness and accomplishment. 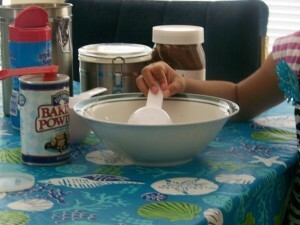 It creates a strong bond: Preparing your child’s favorite dish together strengthens your relation/bond with your child. One-on-one time is an essential part of parenting. You are teaching them team building skill: When you and your child are working together, they are learning how to work as a team. It’s like “kuchh tum karo, kuchh hum kare”. Improves their attention span and patience level: For example, you are baking a cake or cookies together then use this time as an opportunity of letting your child understand the importance of following a particular recipe step-by-step and paying attention to the ingredient list. When you wait for the cake to get ready, your child is learning patience. Many other concepts come into picture: Apart from following a recipe, your little chef is also learning other concepts too like ratio, measurement, quantity, names of the ingredients. Who knows there might be a budding chef in your own house: There are lots of cooking contests for little kids now a days. That doesn’t mean that s(he) has to participate in one such contest. But you never know there might be a budding chef in your own house. With today’s busy lifestyle, it has become hard for many of us to find that one-on-one time with our children. Working together in the kitchen can be a very fun and useful option for this kind of a situation. You need not have to create a master dish. Even making Pizza for dinner at night, a Lemonade, a Mug Cake for dessert or just asking them to peel potatoes or wash the veggies can be enough and a fulfilling experience for both of you. So, don’t let your little chefs miss this wonderful experience and opportunity to have the special one-on-one time with you in the kitchen. I am Alpana Deo- wife, mom& person behind www.mothersgurukul.com. After finishing up my studies & then working in India for sometime came to the USA 9 years ago. During this span,I got to know American culture very closely. With a desire to stay connected to my educational background & Hobby of writing put together my website ‘Mothers Gurukul’-a place not only for moms but for all the parents who’re trying to raise their kids in two very rich but totally different cultures. I am a Guest contributor for few other websites namely Bloggy Moms, Indian Moms Connect, Hindi Gym. Other than that, I am a NRI Contributor for the prestigious Times of India (TOI). Also, you can read my interview on 53-weeks.com. Join me on my journey. Follow me on my journey as a Wife, Mom, Blogger and Writer.